This black and white photograph shows an illustration of Harvey Dwight Rice, (1821-1903), one of the founders of Washburn University in Topeka, Kansas. 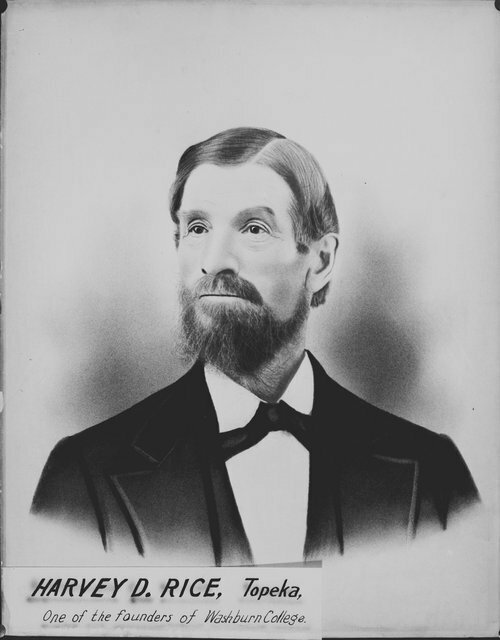 Rice came to the Kansas territory, in 1856, as a member of the Beecher Bible Company. He fought alongside Union forces at the Battle of the Blue and was involved in a few minor skirmishes during the war. In the early 1860s Rice and friend John Ritchie borrowed the money to purchase 160 acres of land in the central portion of the capital city. The site became the future home of Lincoln College, later renamed in 1868, Washburn College. He was instrumental in building the college from the ground up as he supervised the construction of the first building on the campus grounds. Rice was also appointed, in 1858, as a member of the original board of trustees. From 1901 to 1902, he served as president of the board. In 1902, Rice was recognized for his years of dedication and service to the college when the Science Hall, the first building built on the campus, was renamed Rice Hall. On June 11, 1903, Harvey Dwight Rice died at the age of eighty-two at his family farm east of the capital city.